"Every time something in my client's daily life has gotten better, because of exercise. That is what gives me the energy to keep working hard". Juan is a personal trainer on his third year but has been coaching in various sports for more than ten years. Juan provides his clients with a completely customised and enjoyable approach to their health and fitness goals. Whether you are close within reach to your goal or you do not know where or how to start the journey, Juan will motivate you and follow you all the way to the finish line. His training routines are hard, rewarding and they get results. Juan has always been related to sport in some way. He loves competition and is typically involved in one or two sports, while practising many others, solely for the enjoyment of movement. He is very careful choosing his sources of knowledge information. 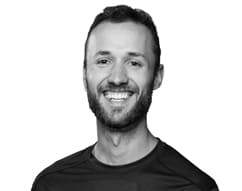 He combines this with practical understanding of strength and conditioning training, delivering energic and fun workouts. Working out with Juan means you will get the exact exercises you will need, so you will be able to reach your goals and keep them. His aim is the give clients the best training experience possible. Not only to ensure they achieve their result they want physically, but to also keep them motivated along the way. Squat jumps, because I love the feeling of a powerful take off and being in the air. What has been your favourite moment/highlight of being a PT? Every time something in my client's daily life has gotten better, because of exercise. That is what gives me the energy to keep working hard. Having a nice breakfast. It gets me going and ready to start a new day.